After about 1900 inspiration came less frequently to Homer. That he reworked older paintings almost as much as he painted new ones, and that the new ones were often re-visitations of earlier subjects rather than new and direct experiences of life or nature, suggests diminished powers of invention and the less frequent occurrence of fruitful pictorial ideas. But as he wrote to his patron and dealer Thomas B. Clarke in 1901,"Do not think that I have stopped painting,. At any moment I am liable to paint a good picture." And he was absolutely right. His late subject pictures, beginning with Gulf Stream of 1899, tended also to be summary and synoptic. For as great artists often do in their last works - as did Titian, Caravaggio, and Paul Cezanne - Homer's work take up again not out of wistfulness or nostalgia, but with an understanding of a lifetime's experiences, deepened by adversity and intimations of mortality, laced with memories and (re)arranged by reflection, and in a language of form grown intolerant of pictorial waste and expressive digression, those subjects that were closest and meant most to him. Homer painted Gulf Stream when he was sixty-three years old, in the year following the death of his father, his one surviving parent, and in the last year of the century - a confluence of circumstances, despite Homer's advanced age, that might all too easily have caused him to feel, as never before, alone, abandoned, and mortally vulnerable. The painting addressed Homer's feelings of trouble and temptation, the approaching inevitability of life's end. Homer visited Nassau and Florida from December 1898 to February 1899. 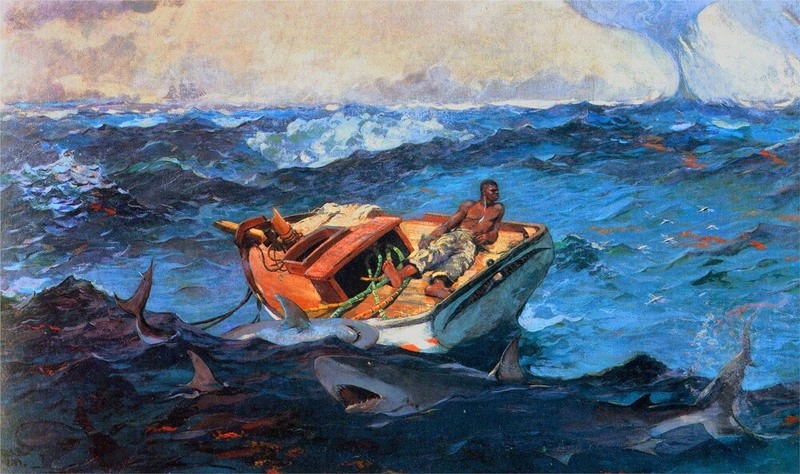 That visit, with the passage through the Gulf Stream that it required, probably triggered the painting. But it was not its source - only its stimulus. Emotionally and artistically, Gulf Stream was rooted far more deeply within Homer himself and in his past.